No matter how old you are, you never get over high school. 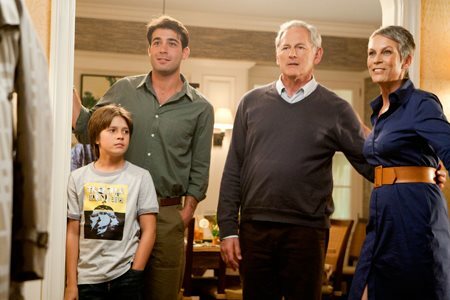 Successful PR pro Marni (Kristin Bell) heads home for her older brother’s (Jimmy Wolk) wedding and discovers that he’s marrying her high school arch nemesis (ODETTE YUSTMAN), who’s conveniently forgotten all the rotten things she did so many years ago. Then the bride’s jet-setting aunt (SIGOURNEY WEAVER) bursts in and Marni’s not-sojet-setting mom (JAMIE LEE CURTIS) comes face to face with her own high school rival. The claws come out and old wounds are opened in this crazy comedy about what happens when you’re reunited with the one person you’d like to forget. Download You Again in Digital HD from the iTunes store. You Again images are © Touchstone Pictures. All Rights Reserved. It's good to see Kristen Bell getting work. I've liked her ever since Veronica Mars and her natural charisma lights up the screen when she's on it. When you throw in Sigourney Weaver and Jamie Lee Curtis (who play the 'grown ups' in the movie) you have a cast that ought to be solid gold. Unfortunately, it's not. 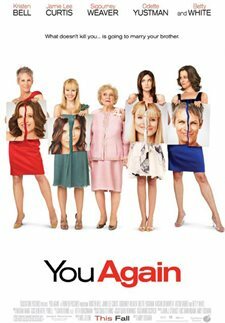 "You Again" gives us Kristen Bell as Marnie, a girl who was "ugly" in high school and was tormented by Jonna (Odette Ystman) a bully. When Marnie, now grown up and pretty and successful, finds out that Jonna plans to marry her brother she almost goes to pieces and then sets out to show her brother who she really is. The movie takes turns making us wonder who we're supposed to have sympathy for and while the more mature leads (Weaver and Curtis) are excellent the final product is an inexplicable mess. I get that there's got to be enough material to stretch the premise out--although one wishes they could've just come up with a meatier premise--but the movie feels unfinished. Perhaps there was some more explanation of Jonna on the cutting room floor? I'm not sure. Bell is a strong actor and the movie really focuses on its female leads leaving the men in the movie (including an uncredited appearance by a professional wrestler) with very little to do. That's not a criticism: there are plenty of movies that go the other way. The problem here is that the material simply isn't up to the task of keeping us interested--especially if we feel that Marni (the most sympathetic character) is behaving poorly in the beginning and then switch over to feeling confused when new facts come to light. It isn't deft movie making to have the audience sit up and wonder if this is plausible. If you like Weaver and Curtis it might be worth going to see them together. If you really like Bell (as I do) you might want to just see her. If, however, the cast doesn't draw you, the movie probably won't. You Again images © Touchstone Pictures. All Rights Reserved.